"A great way to use those end-of-season tomatoes! This is my mom's recipe." 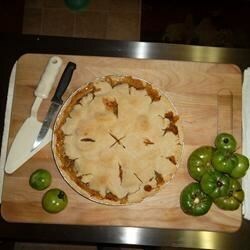 Prepare pie plate with bottom layer of crust. Mix together the flour, lemon peel, lemon juice, butter, ground cinnamon, sugar, and salt. Stir in the green tomatoes to coat. Pour into crust. Cover with top crust. Cut slits in top crust to allow steam to escape. Bake at 450 degrees F (230 degrees C) for 10 minutes, then reduce temperature to 350 degrees F (175 degrees C) and bake another 30 minutes or until crust is golden and filling is bubbly. Allow pie to cool before serving. A co-worker made this pie and it's delicious. The only change she made was to add about a teaspoon of freshly ground nutmeg. It's wonderful! This is excellent!!! Tastes awesome and my family loved it!!! Way too much lemon. So I'm back to looking for a recipe.